Capsicum is a common condiment in some cultures. The Capsicum plant grows in warm climates and is added to many herbal formulas as a catalyst for the other herbs. Its red colour is partly due to its high vitamin A (beta-carotene) content. Vitamin A is essential for normal vision, growth, cellular activity, reproduction and healthy immune system. Capsicum influences circulation and blood flow (just watch someone’s face when they eat a food laced with it). 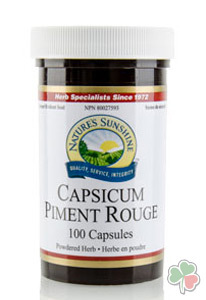 Nature’s Sunshine capsicum has 35,000 to 45,000 heat units per capsule. Suggestion Directions: Take one capsule four times daily with food.